One of the most and very few of the temples dedicated to the Lord Hanuman, the Viswaroopa Adhivyadhihara Sri Bhaktha Anjaneyaswami Temple is home to 32- feet idol of the monkey God. The beauty of this idol lies in the fact that it is sculpted out of a single granite stone. This idol was consecrated in the year 1995 after being constructed in 1989. Along with the idol what draws visitors to the temple is the huge 90-feet shrine. Visitors in seek of good health among others flock to this temple for blessings. Being a Hanuman temple, you will obviously have the idols of Sri Rama, his brother Sri Lakshmana and his wife Seetha indoctrinated here. The temple lies a little outside the city, at a distance of some 10-odd kilometres. Also, visit the popular attractions in the city by following Chennai itinerary 1 day. Saturdays there is a special Pooja performed. If you want to avoid crowd, do not visit on Saturday. How popular is Anjaneya Temple? People normally club together Madras Crocodile Bank and Chennai Central while planning their visit to Anjaneya Temple. People also prefer to end their day with Anjaneya Temple. The temple was very nice. Lord anjenaya was charismatic. The facilities nearby the temple were very good too. The temple was neatly maintained, and thus gave a good radiance. Shops outside temple are also good for food and children. Would love to visit again, and seek blessings. I've been staying at the Lotels a few times a year for over many years and love it. This trip I brought my family and the kids loved it. Its walking distance to shopping complex and all the sites but quiet enough at night to get a great sleep. Neat, clean and beautiful temple. Lord Anjaneya grabs your attention as soon as you enter the temple, and the spiritual feeling you get when inside the temple, is one of a kind. Mornings, the temple management serves hot and tasty prasadam on all days. 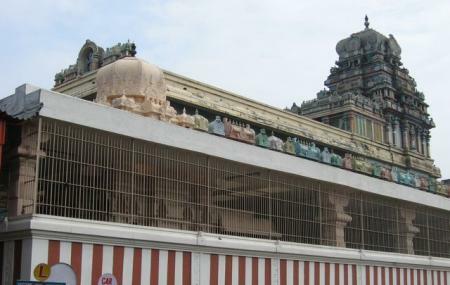 A must visit temple in Chennai.